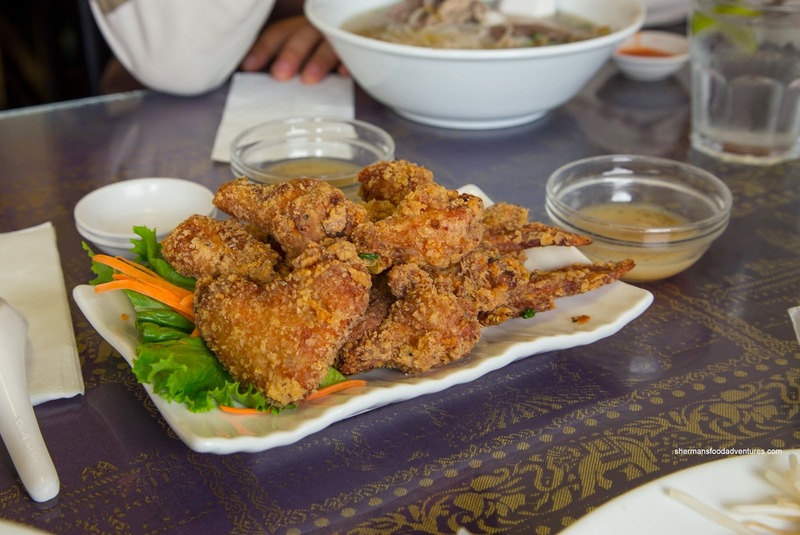 As much as Phnom Penh is synonymous with Cambodian food in Vancouver, there are, in fact, other places where one can get similar eats including those famed chicken wings (albeit usually not as good). 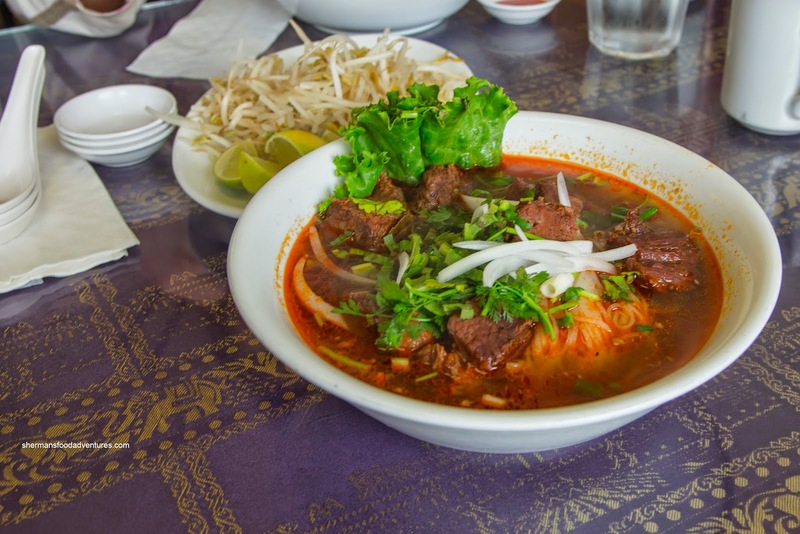 After Sunday morning hockey, Milhouse, Kaiser Soze, JuJu and myself decided to hit up Angkor for some Cambodian eats in hopes of finding an alternative to the always busy aforementioned Phnom Penh (and the fact it has been blogged to death!). 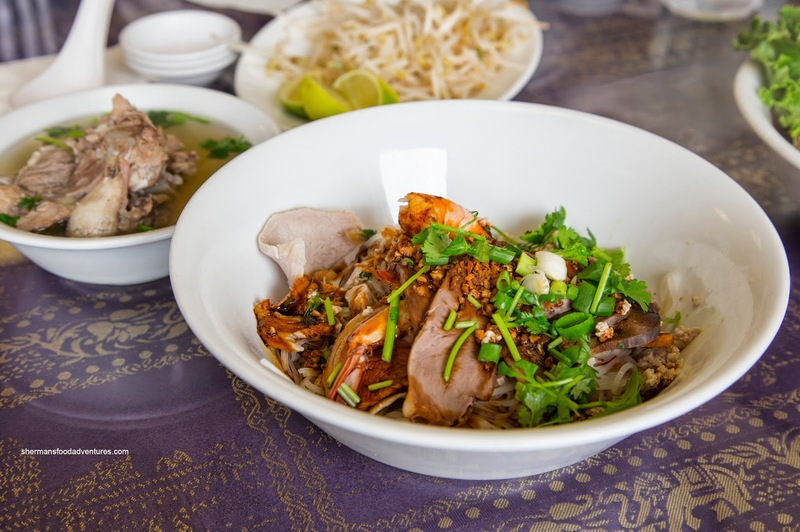 For myself, I ended up getting the Phnom Penh Dry Rice Noodles which was pretty good. Topped with the usual seafood and meats including shrimp, liver, sliced pork and ground pork, it was also sauced with a sweet soy. When mixed together with the chewy noodles and side of blanched sprouts, it was a good balance between savoury and sweet. The noodles were a bit clumpy though. The accompanying pork bone soup was sweet with a good amount of melt-in-my-mouth meat. Milhouse had the Angkor Beef Stew Noodles which looked quite appetizing. Sampling the soup and it was indeed flavourful and somewhat aromatic. There was depth and a sweet meatiness. 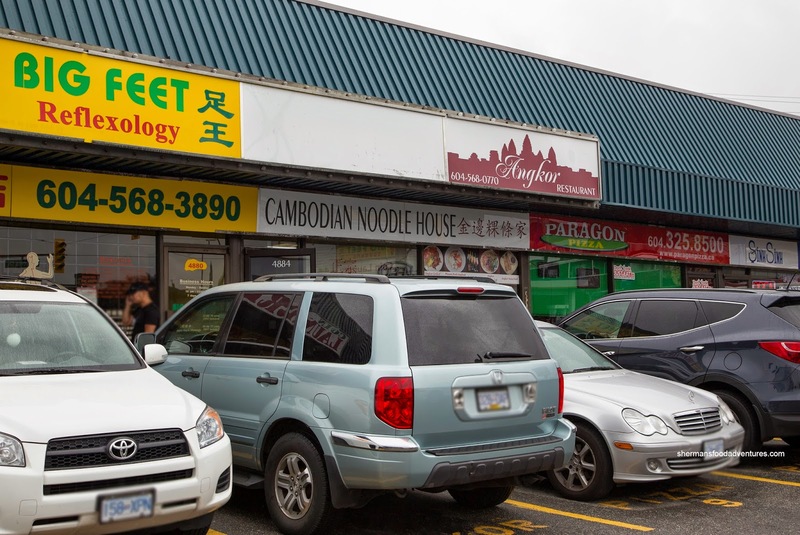 As for the meat itself, it was fatty and tender while the noodles were al dente. 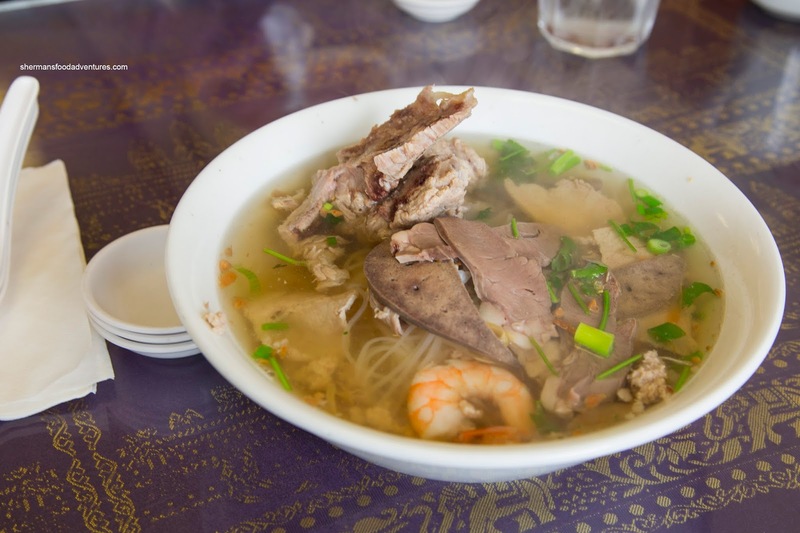 Kaiser Soze had the Phnom Penh Rice Noodle Soup in a sweet, flavourful broth. Obviously aided by MSG, there was depth which helped flavour the noodles. The meats were tender and abundant while the large pork bone was a treat. JuJu wanted to be different, so he went with the Chhar Kropus & Rice. 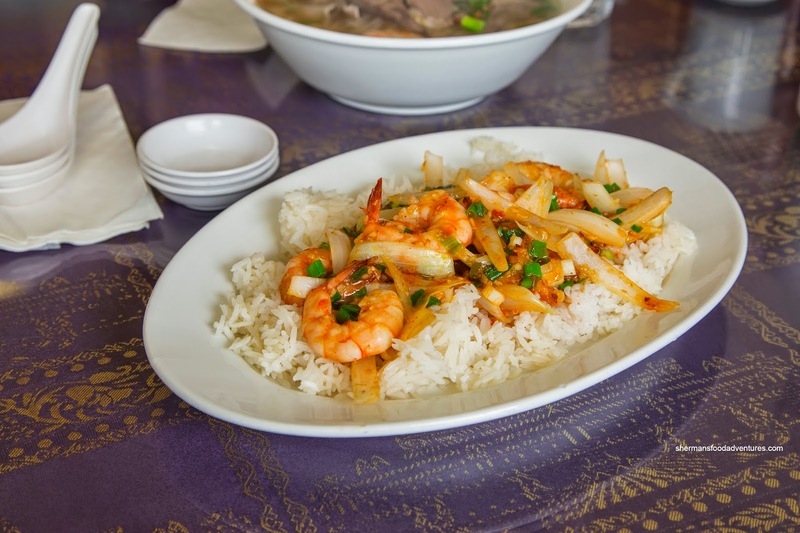 The prawns had a meaty snap while being bathed in a garlicky and onion spiked stir-fry. The rice itself was dry enough to absorb the moisture without getting too soft. As tasty as it was, JuJu was left a bit hungry due to the modest portion size. No matter though as we got a large order of the Deep Fried Chicken Wings to share. Served with 2 large bowls of lemon pepper dip, this was trending towards the Phnom Penh version. Yet, it was not as good. Although lightly crisp on the outside, the skin was not a rendered nor was the wings themselves that flavourful. Inside, the meat was juicy though. Although not without faults, Angkor offered up eats that satisfied. Furthermore, the prices were very reasonable.